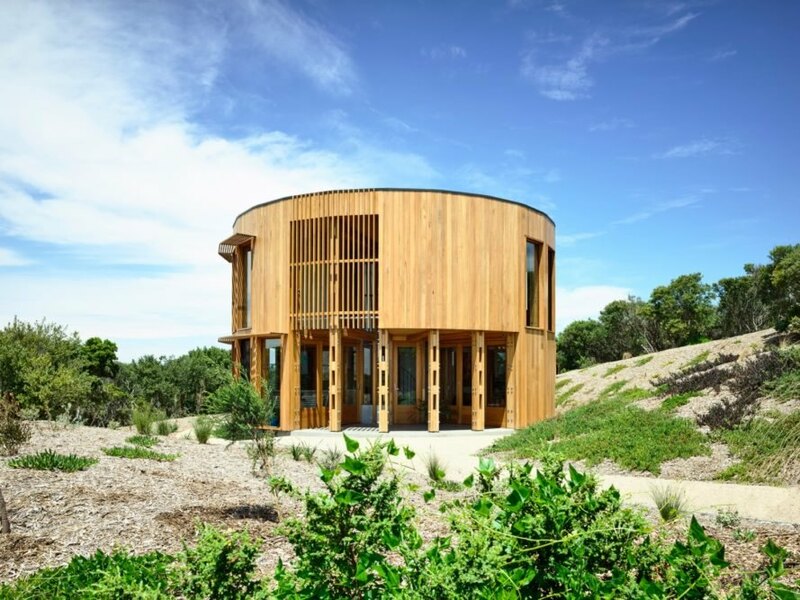 A charming, circular escape from the city has popped up on an idyllic stretch of beach in Australia. 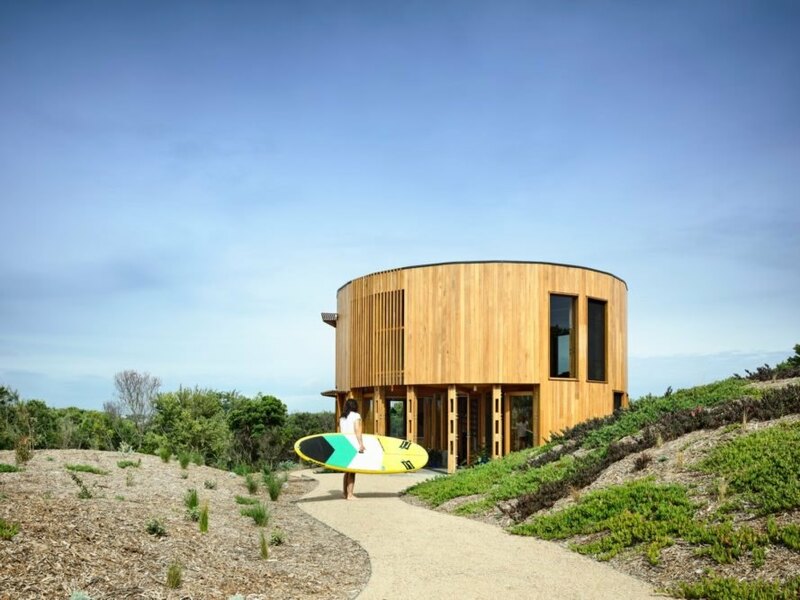 Powered with solar energy and built with weather-resistant materials, the St Andrews Beach House is the work of Austin Maynard Architects, a Fitzroy-based design practice that prides itself on sustainable architecture. The “Euclidean form” of the dwelling was inspired by the beauty of the remote site and is designed to take advantage of views in all directions. 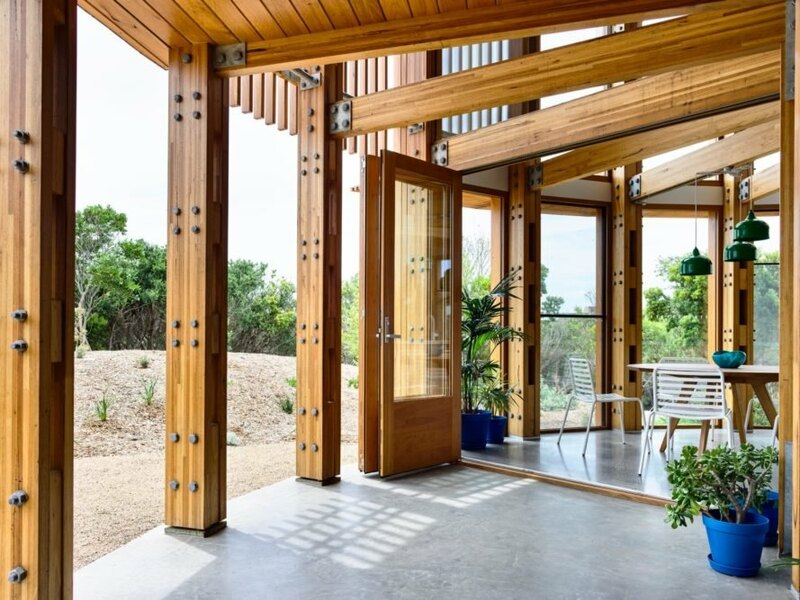 Located on Victoria’s Mornington Peninsula along secluded coastline near national parkland, the St Andrews Beach House is surrounded by stunning vistas of the water, wild bush, sand dunes and scrub. 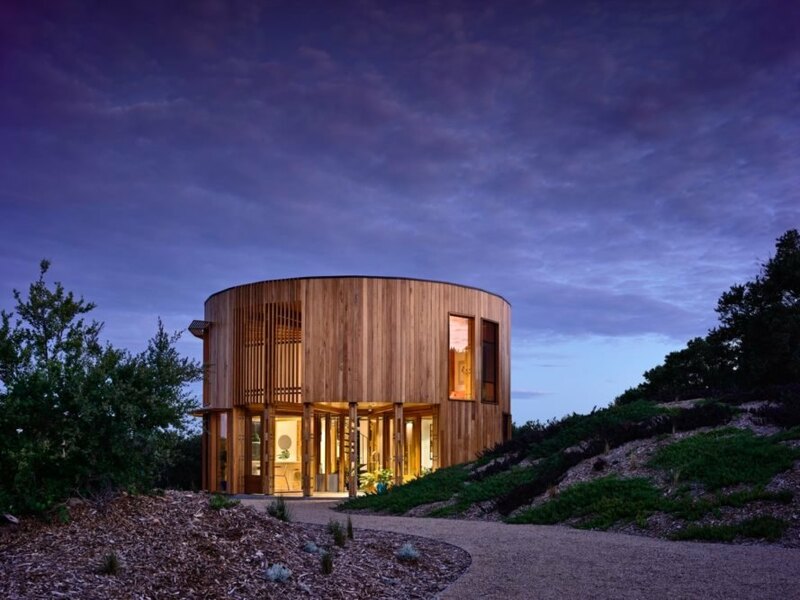 The simple two-story circular structure was a site-sensitive response to both the fragile environment and the client’s brief for a ‘bach’ — a New Zealand word commonly used for a very modest holiday home. The simplicity of the home’s design helps focus attention on the landscape, while its self-sustaining construction minimizes the building’s environmental footprint. The communal living areas are located on the ground floor while the bedroom and bathroom zone are upstairs. 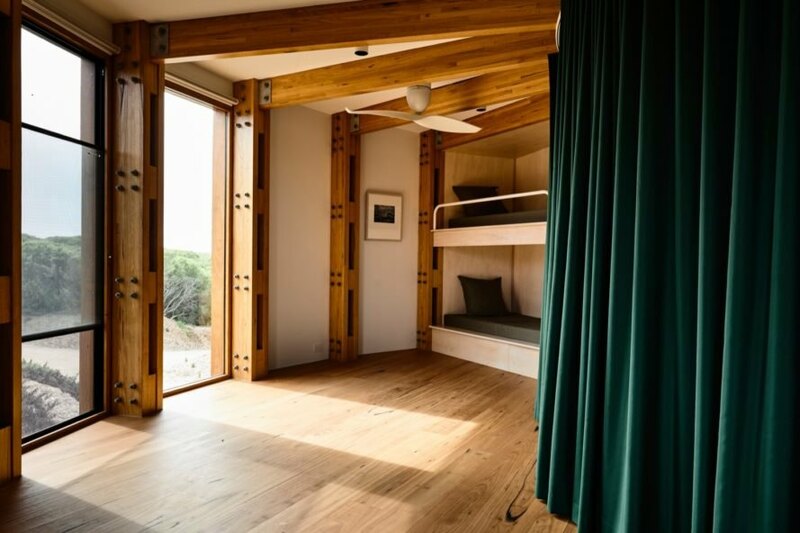 In addition to the home’s small footprint and use of durable materials, the beach house was built with rooftop solar panels as well as double-glazed windows. A large cylindrical concrete water tank harvests rainwater for reuse in the toilets and for irrigation. Austin Maynard Architects designed this charming beach house in New Zealand. The house is powered by the sun. The architects pride themselves on sustainable architecture. The house takes advantage of serene views in all directions. A neutral palette keeps the focus on the outdoors. Pops of green further tie the design to the environment. The upstairs houses private areas, such as the bedroom and bathroom. The home sits right along a secluded coast on Victoria's Mornington Peninsula. 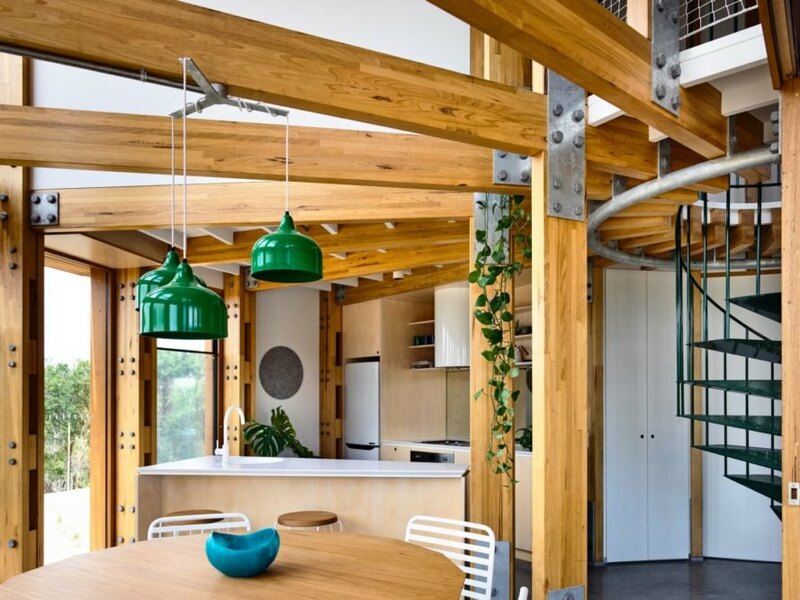 The home embraces green design inside and out.